Speaking volumes without uttering a sound, this is Peter Miles Bergman’s lifetime investment. 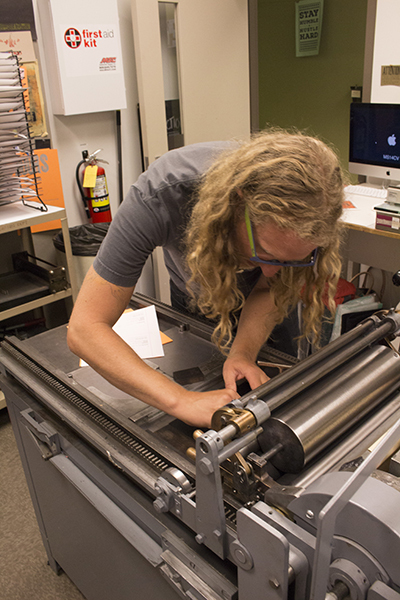 He is also a professor in MSU Denver’s Communication Design Department. Art is at the root of Bergman's pursuits, creating art and finding practical and altruistic ways to make it talk. He uses art to grow intertwined networks of communication and to move beyond the idea of simple graphic design. 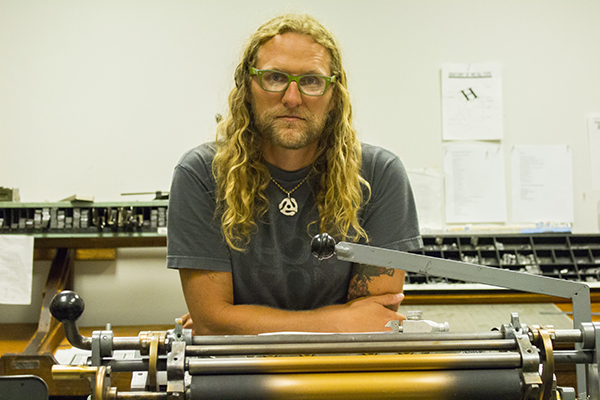 Teaching at MSU Denver has given Bergman the unique opportunity to help student artists do the same in their creative journeys. “This program is communication design because it goes beyond just creating graphics. That term has come to denote some kind of over-the-counter service,” Bergman says. Communication design, according to Bergman, involves many other types of work that include writing code, completing design research, and creating motion graphics. By encouraging and embracing this variety of design skills, Bergman and his colleagues are working to create a shift in the professional application of communication design as a consultative service. He wants to take the idea of creating visual products for clients to the next level. It’s about helping clients to create a branding and messaging system to reach their audience. These are products made from their own imagination and the relationship with their designer. Bergman has come to this appreciation of communication design by experiencing it from two schools of thought. One is primarily about practical application in the professional field, and the other focuses on fostering the next generation of graduate students and professors. Bergman attended the University of California, San Diego, in which design was taught as a practical trade. He earned his Master of Fine Arts degree from the Art Institute of Chicago, an elite school and museum that focused on using design as a tool of authorship. These very different educational roads converge in MSU Denver's Communication Design program, offering the best of both worlds to its students. The program and professors, like Bergman, prepare graduates either to proceed to graduate school or the working world. “MSU Denver is in the sweet spot in the middle where we have an awareness for what you’re going to do when you leave here. A little bit of research-based mentality and a little trade school mentality. It just depends on the teacher or the class focus,” Bergman says. Staying true to his creative roots, Bergman recently held a show called “Signs and Letters, Intrusions into the Everyday.” It was a conceptually driven show that used typography and letters to talk about interactions with people that can be, and often are, politically and socially driven. “It’s communicating your opinion about [issues] in an opaque artistic way that the person on the receiving end is going to find confusing or questionable and will have to reassess their own views on that particular issue,” Bergman says. To create some things featured in the show he used a machine called a Vandercook proof press, which can create proofs of a variety of things. Letters are chosen and placed, punctuation inserted, sizing chosen, line alignment and leading are set. In terms of setting up the machine, he says the skill level of the printer and complexity of the design will dictate how long it takes. It could take as little as 45 minutes or upwards of 20 hours. “So, if we were working for the newspaper, we’d set all the type for the article; we’d bring it to this machine, make one print, do all of our editing – like if there are bad letters, fix spelling. Then the clean proof type would go to another press to mass-produce on an electric machine with a motor,” Bergman says. Bergman has also created several large-scale installations, for example one in 2012 that contributed to a larger conversation taking place about an urban camping ban. He installed and created trail maps, two dozen trail marker signs, 100 trailblazer flags, and four large signs that divided the area into sections. These were installed in the Lakewood Gulch, running from the Platte River west to the foothills on the west side of Denver. “I created a whole icon system [of signs], some of which were like hacks of traditional icons like the walking person but they’re drinking, designating areas of that gulch where people already do those things and making it kind of official. Some of it was sort of sarcastic and inflammatory, some stuff more practical,” Bergman says. The space, according to Bergman, had been run down for a long time with homeless and fringe individuals, day drinking, people tagging and doing graffiti at night, and sometimes just people walking their dogs, all casual, unsanctioned uses of the space. The signs and trail markers he created spoke to the kinds of conditions that existed in the space. These are examples of the kinds of conversations that Bergman hopes to spark with his art and help his students to create by using their design knowledge and applying their skills. He admits, though, that this does not come without its struggles, and encourages all of his students to persevere during times when they feel they aren’t progressing, which at times seems more often than not. Bergman exhibits this in his own life, maintaining a full-time teaching and advising position at MSU Denver, pursuing tenure track, organizing shows, and continuing to create. He believes that no matter what you decide to do, go with the option that you’re passionate about. “Decide if you're going to do things the way everyone else does them, or if you won’t,” Bergman says. Use all of the code writing, design research, motion graphics, art principles, and toiling in obscurity to create work that speaks volumes about your skills and education, and communicate with the professional world without uttering a word.